Have you ever had a color that you were stuck on, but couldn’t seem to find a nail polish to match that shade? No? Just me? Ok. Well, I really wanted a saturated olive green creme. I have a ton of olive greens in my collection but all of the cremes seemed to have too much grey in them. I had kept my eye out for about a month when I saw this polish on a little display at Ulta. I had never heard of MP nails so I figured, why not give it a shot. 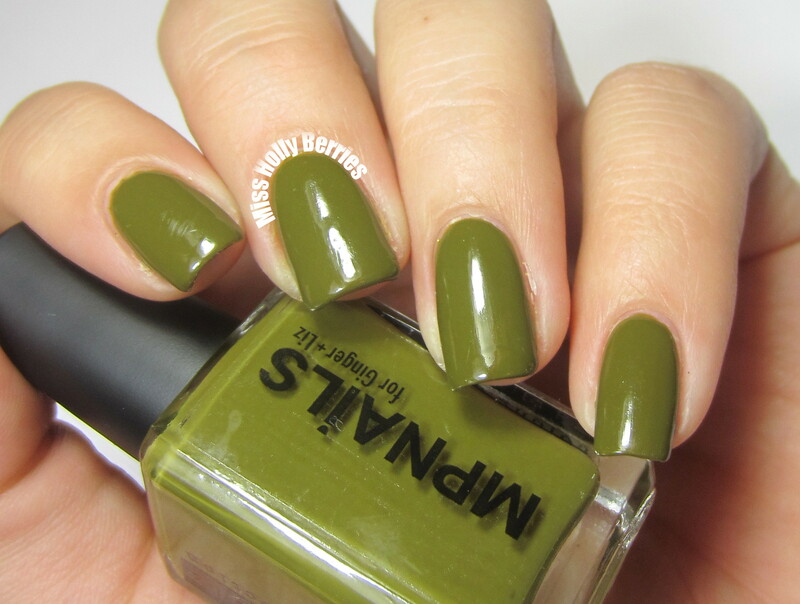 MP Nails for Ginger and Liz “Sam-Poole Sale” is a saturated olive green creme. Exactly what I was looking for! MP stands for Madeline Poole, aka Sally Hansen’s Global Color Ambassador! I tried to do some research on Ginger and Liz, but sadly I couldn’t find anything. If any of you know the story behind Ginger and Liz, let me and others know in the comments! The formula for this polish was ON POINT! Maybe I’ve been so used to the creme formulas of OPI and China Glaze, but I was pleasantly surprised about this shade. It was perfectly opaque in 2 coats and had that “goldilocks” formula that I always talk about … not to thick, not to thin, just perfect in the middle. I really love this shade and it was definitely a favorite polish for me this month! What do you guys think? Do you have any colors that you’ve been trying to find in polish form?